Lyric has a home! 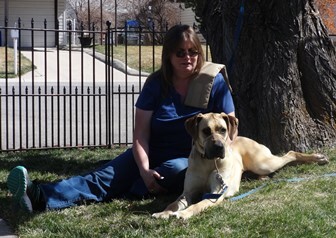 - Rocky Mountain Great Dane Rescue, Inc. Lyric has a home with her foster in Rifle, CO!! Sherry initially came to RMGDRI to foster. What she didn’t expect was to fall in love so quickly! She brought Lyric into her home as a foster but she fit so well into the daily routine that Sherry couldn’t imagine letting her go. Lyric has a fellow 8 yr old Great Dane to look up to and a few chickens she can recruit as partners in crime. Woot! Woot! Lyric.